Khanduala Waterfall is located at Kalahandi district of Odisha. 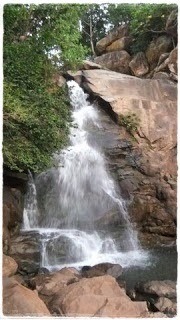 This waterfall is best tourist place of this district. The waterfall is dropping from the hill station with an small structure with an beautiful surrounding. This waterfall is creating an place of beauty. Also this place is best for picnic spot of Odisha. The side of the waterfall an wildlife sanctuary is their name is Karlapat Wildlife Sanctuary that is one of the best tourist place of Odisha. Also this waterfall falling from the top of the hill and in the top of the hill Goddess Khanduala situated that is increasing the place beauty. As per historical the Godess Khanduala situated in the top of the hill and the waterfall start falling near side of the temple that's why the waterfall name is "Khanduala". This place is getting thousands of tourist every year because of this place is one of the best scenic beauty place. So visit this place to know more details about the waterfall. Road ways : This place is 418 km from Bhubaneswar and 32km from Bhawanipatna. Also all types of road travel facilities are connected to this place. Rail ways : The nearest railway station is Kesinga that is 35 km from this place. Air ways : Nearest airport is Bhubaneswar then you can easily visit this place. Their are some private hotels are their like Hotel Ruchi, Puspa Lodge, White House and many more hotels.